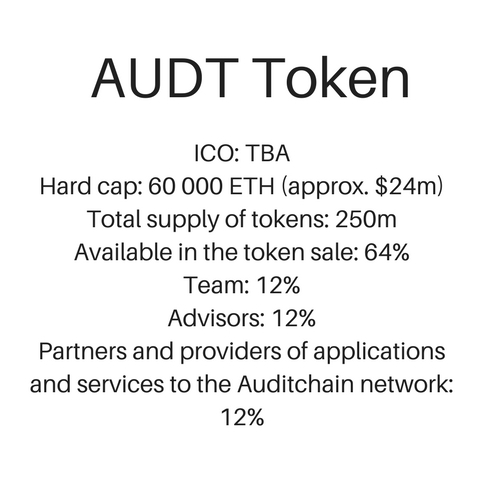 As the first continuous audit and reporting protocol system for enterprise and token statistics disclosure on the blockchain, Auditchain will be providing its users with the highest levels of trustless assurance. The network aims to provide complete transparency for investors and stakeholders, and the AUDT Fees for enterprises can be reduced to zero through enterprise participation in the ecosystem. The AUDT token has several functions. It unlocks the features of the network of enterprise and trustless assurance services, and lets users access and pay for the services of the Auditchain Network. The team is headed up by Meyers, who has a notable background in investment banking and venture capital – including founding one of the first FinTech investment banks. He is also the founder of Vestcomp Ventures, and focuses on the incubation and acceleration of Blockchain and Distributed Ledger Technologies. He is joined by General Counsel Regulatory and Government Affairs, Paul Ostling, Director of Assurance and XBRL Architecture, Eric Cohen, Chief Scientist, Stuart Haber Ph.D., Chief Financial Officer, Strategic Development, Accounting and Assurance, Rimas Vaitauskas, and a team of other directors and developers. Why did you decide to launch Auditchain? Why is it on the blockchain? What is the most exciting aspect of Auditchain? Why is now a good time to launch? Why should people invest in Auditchain? “We can’t provide investment advice. But, if anyone believes in consensus based integrity of records and that assurance should be decentralized, truly independent, and not influenced by the amount of money paid to an assurance provider by a single enterprise, then you should rally around the community that is making that happen. We welcome everyone to join our Telegram and connect directly with us on a daily basis,” he adds. We rate Auditchain as a Solid ICO due to the strong team and useful protocol system for a large addressable market.